AboutAcura: Top Gear reviewing Acuras? The hit British motoring show, Top Gear, could be heading its way to the United States. There are reports that the "show will be fronted by current presenters Jeremy Clarkson, Richard Hammond and James May." Also, no one can forget the Stig. The format of the show will be similar to the British version, however geared more towards "American" cars, such as Cadillacs. This also could include Acuras, as it is mostly a North American brand that is slowly spreading to the rest of the world. The show will also have US stars test their driving skills. A spokeswoman for the BBC confirmed that BBC Worldwide - the corporation's commercial arm - had been in talks, but could not confirm details. In November 2005 it won an international Emmy award for the best non-scripted entertainment show. Last month an estimated eight million people tuned in to see the last episode in the series - BBC Two's largest audience for 10 years. 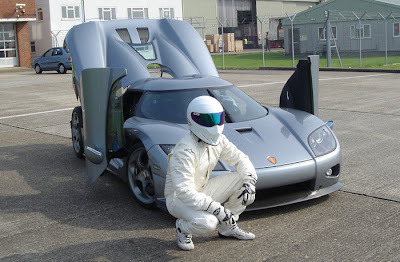 Stig in front of Koenigsegg.